The Elks Club in Havre used to host several women entrepreneurs who set up a table and sold a variety of goods, mostly jewelry but also other things like thermal totes. One of the sellers was Roxanne Mangold, a lady whom I’ve known since childhood. She was selling Cookie Lee jewelry but also other things and brought in the cutest lamp she had made. It was in the shape of a cat, so of course I had to have one! She had gold or red, so I chose the red to go in my Parlor. It sits behind one of two wing chairs made by Yellowstone Furniture Manufacturing Co. made right here in the Great State of Montana. 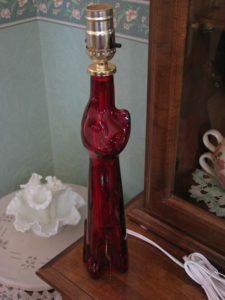 Kitty lamp without the shade, to show off how cute it is!